Spiders belong to an ancient group of animals called the Arachnida. Arachnids include scorpions, ticks and mites, harvestment and false scorpions. Worldwide there are about 36,000 spider species. Approximately 2,900 species of spiders are found in Australia. Almost all spiders possess venom for the purpose of subduing their prey – normally insects. This makes spiders on eof the most beneficial of invertebrate groups. Spider Venom is occasionally used against humans. This usually happens when the spider is trying to defend itself. While many spiders are not able to penetrate human skin with their fangs, those that can occasionally inflict painful and , in rare cases, dangerous bites. 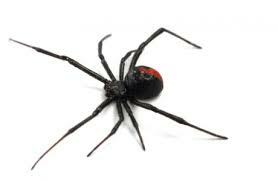 Only a few species, including the Redback Spider and some funnel-web and mouse spider species, can inflict bites that are potentially fatal to humans. One of the most dangerous of all is teh Sydney Funnel-web Spider. There have been not fatalities from Sydney Funnel-web bites since the development of effective antivenom. Aggressive in summer and autumn..
logs, rubbish in dry and sheltered areas. in gardens. Will wonder inside home.